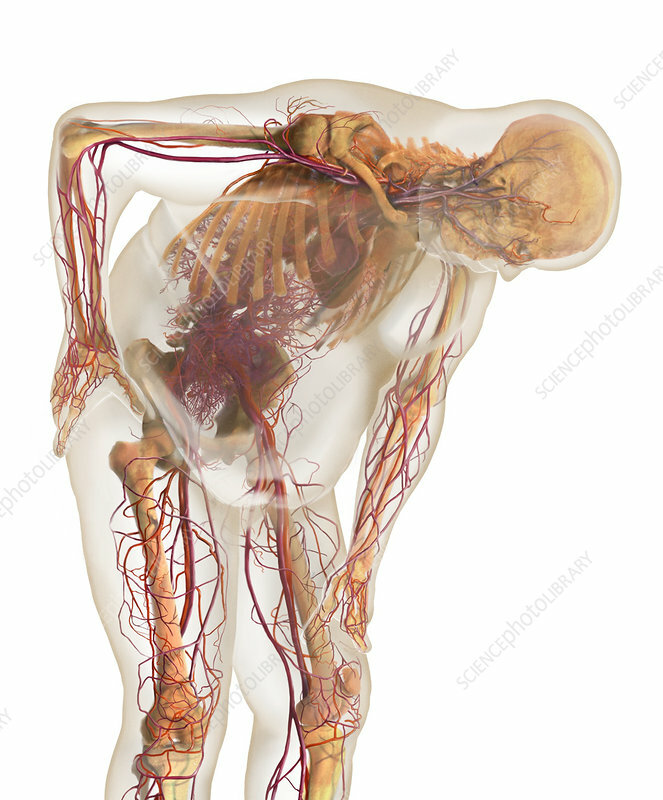 Medical visualization showing an overweight anatomical model revealing the skeletal and circulatory system. After the body takes in food, the circulatory system delivers nutrients and energy to the body's cells. Immature fat cells expand and transform into mature fat cells when there is an excess of energy in the body (caused by overeating). This is the way that the body stores extra nutrients in case we need them later. If the body continually receives and stores extra nutrients, this can lead to a large amount of fat in the body. If overeating leads to obesity, the risk of cardiovascular disease increases and atherosclerosis, aneurysm, heart attack, and stroke becomes more likely.